Susanna Schick. Photo by Robert Verez. First, let me say that the stunning photo you’re looking at of this episode’s guest, Susanna Schick, was taken by Robert Verez. You can see more of his work on his website, Robert Verez Photography. I almost can’t look away from those sunglasses! 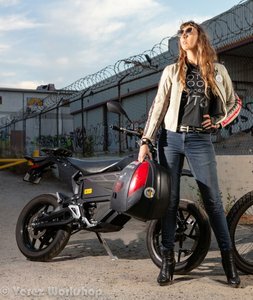 You may remember a couple of episodes ago (ahem: Episode 25, Hammy Tan, scooterist extraordinaire) when I mentioned during the news segment a fun review of the Zero FXS. I liked it so much I tracked down the author, Susanna Schick, and she agreed to be on the show. She was a lot of fun to talk to and I learned a ton about not just Zero, but electric vehicles in general. There really is nothing like talking to somebody who knows a lot more about a subject than you do, and frankly, that’s one of the reasons I started this little show in the first place. 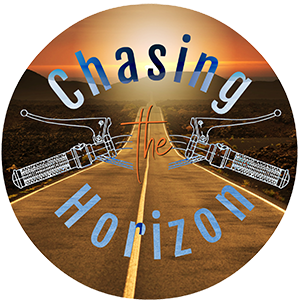 If Star Trek was all about exploring the universe, Chasing the Horizon is going to be about exploring the motorcycling universe. (I know, that was a real stretch as far as analogies go, but what can you do? I’m the one with the keyboard here!). I could go on & on about Susanna – did I mention she was a fantastic guest yet? – but I have to make a small confession. I wasn’t planning on putting this episode out in July, least of all on the next-to-last day of July. I planned on waiting until NEXT Monday, the first Monday in August. Then it would be an easy four weeks until kicking off Season 2 on the first Monday of September (which I just now realized is Labor Day, and everybody will be outdoors having fun and not indoors listening to my podcast). Sometimes, though, things fall into your lap that you just can’t hold on to. Today … well, yesterday by the time you read this (or some other day in the future), that’s exactly what happened. You see, Harley-Davidson made a stupendous announcement. It had nothing to do with trade wars or plant closures and everything to do with three new bikes they’re going to put on the street in 2020. An adventure bike with looks that are going to polarize the adventure bike market. 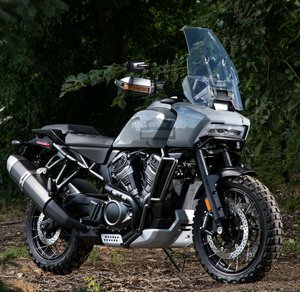 An adventure bike that no matter what it looks like could very well polarize the Harley market. Plus a street fighter and a bike called the Custom that could very well spell the end of the Sportster line as we know it. The bottom line is I just couldn’t wait until next week to talk to you about these developments and more from Harley-Davidson. My friend and Episode 24 guest Scott Auld even suggested an amusing tweak to the bumper at the top of the show. I put more photos of these new Harley-Davidson motorcycles in this web directory right here. Enjoy. MOA Membership Plug: The MOA Getaways. Head to the main MOA website and click “EVENTS” on the menu bar. BONUS LINK: You don’t need a 1200-plus-cc behemoth to do some amazing riding, as this scene from the James Bond movie Skyfall shows us! 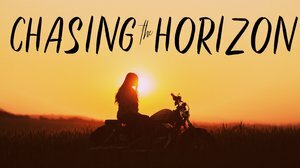 EXTRA BONUS LINK: Harley’s slick video accompanying the news of these new bikes, complete with heart-tugging photos of children and appeals to you to remember your freedom. I’m going to try my best to get another episode out in August, but no promises. Stay tuned – Motorcycle Manufacturer Month kicks off Season 2 on Monday, 3 September 2018! I’ll see you out there somewhere on the road – or off it. Ride safe!